"Wide. Treeless, houseless undulations, clothed with heather and Purple Moor-grass, so filled with lakes and so intersected by arms of the Atlantic that water entangled in a network of land becomes almost imperceptibly land entangled in a network of water, and only the presence or absence of the mauve Lobelia or the brown seaweeds tells whether one is on a lake-shore or on a seashore." What might look like an obscure trail of rocks is actually the remnants of an ancient stone fence. The gradual creep of the bog as grown over the structure to the extent that the top of this fence is now at ground level. Praeger's depiction does great justice to this most profound setting. Resource rich Connemara may be renowned for its natural beauty and secluded tranquility but one of its most evident characteristics is its blanket bogs. During my first visit to Clifden in fall of 1998 I was relatively unfamiliar with the concept of bogs; mentally I had them equated as a form of marsh. For an naive outsider like myself the beginning realization that bogs were something of a exceptional form of terrain came with that first unsuspecting step off the beaten path. It was down by Lough Shanakeever when my foot came down on what was dissimulated as firm, sturdy grass, only to find my leg being gradually swallowed by a rippling sheet of earth. In the course of my stay studying various lakes that had bore sightings a day would seldom pass where I didn't momentarily loose a shoe and finish a step in a sock or return to the hostel completely soaked up to my knees. Negotiating such terrain can demand a bit of practice. Even so it didn't take long before I managed to see bog in the same beauty that brought hikers and naturalists from all over the world to Clifden. There's an ancient stillness that lingers over the sparse landscape. And while the surface may not say much, few other natural substances on earth can conceal layers of history like the bog. Without knowing it you could standing above the remains of a mammoth or an entire prehistoric forest tens of thousands of years old. But not all of the bog's secrets are kept buried beneath ground. The same fence from a wide angle shot. "...animals of extra-ordinary formation, and strange virtues, are supposed to inhabit lakes and rivers." If there was only one area in all of Ireland the peiste would seem most at home within, it would have to be the bogs of Connemara. This western region of Galway boasts a countless number of secluded lakes and pools, the majority of which are interconnected through streams and creeks. During heavy rains these humbling interconnecting passages swell into an impressive networking highway of water allowing fish to enter and escape otherwise isolated pools and loughs. Even though the region is well freckled with bodies both large and small, the peat content is often an inhibiting factor against providing enough nutrients to sustain large numbers of fish. Hence they, along with anything that might feed upon them, are reliant on the fluctuating water levels for a nomadic life within the bog. 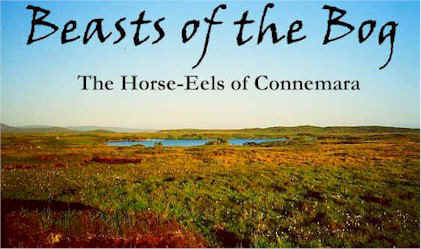 The peiste, or horse-eel as some locals call them, would seem to enjoy a suiting niche in Connemara. What that might exactly be one can only guess but they've apparently been lurking about the region long enough for some of their human neighbors to understand a thing or two about them. Special thanks to the research conducted by Lionel Leslie and F. W. Holiday of the Loch Ness Investigation Bureau, there are a number of revealing 20th century sightings on record from Connemara. But before getting into them it's worth keeping in mind that the individual lakes mentioned are themselves, relatively insignificant. Just because Lough Fadda or Nahioon or Shanakeever all had sightings over the course of the years does not necessarily imply each is the stationary home of a peiste/horse-eel. These creatures have been seen and even found immobilized, during transience between water sources. They've even been observed coming in from the ocean. For generations the farmers and fishermen of Connemara spoke of strange creatures that dwelt within the surrounding bog waters. They were addressed by different names and though somewhat elusive, they were quite real. Children were often warned to avoid certain lakes and even peat harvesters knew better than to work near shore during the evening. Judging by the traditional lore that's survived through the ages it would appear that these animals, whatever they were exactly, were more abundant in previous times. Through the 20th century they were spoken of less and to many were presumed nothing more than colorful folklore. The old generation was passing away and for some adults the childhood warnings regarding 'strange lake creatures' were reflected upon as a relics of the old beliefs. The horse-eel looked destined to enter the company of the banshee and pooka as yet another unique figure of Irish mythology. But in June of 1954 a dying legend rescinded into reality with a terrific splash that would ripple throughout the region. Men were sent with rifles to patrol the lough shore for a creature that had previously existed in rumors and local tales. The 1954 sighting at Lough Fadda in many ways opened the door to a long neglected phenomena spanning across Ireland. In many ways it was the first major report of the 20th century and much of the information available now is subsequent to this incident. There had been at least one known sighting in Lough Fadda prior but two factors made 1954 stand out. The first was a matter of numbers. No less than four well known members of the Clifden community saw the creature and at least two were deeply disturbed by the experience. Numerical credence aside what makes this incident particularly memorable is how the animal reacted towards its audience. It appeared aware of their presence and exhibited a form of behavior that was interpreted as nothing short of hostile. 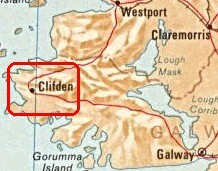 So greatly affected were the witnesses that upon returning to Clifden they insisted men armed with rifles be sent to the scene. Then librarian and experienced angler Georgina Carberry would in a sense become the unofficial spokeswoman for the event. Out of the four she appears to have been the only one to be interviewed by Leslie and Holiday. In summer of 2001 Paul Keogh of the Clifden Library with able to make arrangements to speak with one of the two surviving participants. Despite the occurrence having taken place almost half a century earlier, her unaided recollection consisted closely with Georgina's. 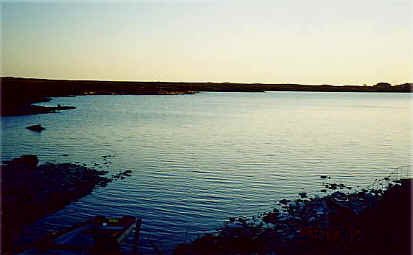 In the center of the lake is the "island" from which the animal approached. Hovering above it is a fish farm. On a June day in 1954 Georgina Carberry and three friends biked down to Lough Fadda. They unlocked a boat owned by the Clifden Angling Association and set out upon it with their fishing gear. By late in the afternoon they'd succeeded in securing a number of trout. The group decided to set the boat ashore along a finger of land that almost splits the lake in half. As they were settling down with their tea one of them pointed out an object moving from "an island" (the island?) which she assumed was a man swimming. Soon it became apparent that it was too big to be human. The mysterious object was approaching them at a very leisurely speed. As it began to draw close concern arose within the party. When it reached within twenty yards distance Georgina made the first move and jumped back, the others took cue and likewise got some distance from the water. As soon as they'd moved the thing swung right around a rock near the shore and dived. In less than two minutes it had gone practically up to the island again where it reappeared. When the creature came close to the group on shore it opened its "huge great mouth". Two big humps were noticed sticking above the water behind its head. Georgina said she spotted a forked tail when it swung around the rock however the witnesses Paul spoke to, "Ann", didn't recall seeing one. Teeth weren't noticed but the interior was white and Georgina likened it to a shark's. (Interestingly enough, the Stephen Coyne and his wife noted that the animal they saw had an under-slung mouth.) 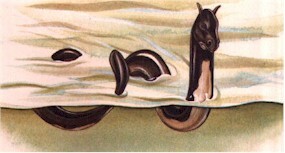 Georgina described the animal's skin as "wormy" or "creepy". When asked by Holiday to elaborate she explained that it seemed to have motion throughout its body at all times. An artist's rendition of the Fadda Monster. Georgina mentioned the animal's mouth was shark-like but did not notice any teeth. 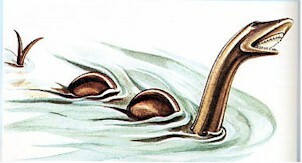 In the summer of 2001, "Ann", one of the remaining members of the 1954 sighting, upon being presented with a copy of the illustration had a few adjustments. She pointed out that the neck was misrepresented as too long and crossed out the tail. Needless to say the party was more than a little bothered by such a frightening spectacle. They anxiously mounted their bikes and fled back towards Clifden. It is said that the whole time on their way back Georgina kept looking behind them as though to check if the creature was in pursuit. Once in town they reported the event to the Clifden Angling Association who sent armed men to guard the area incase the animal revealed itself again. Georgina claimed to have reoccurring nightmares afterwards and avoided the lake for a good six or seven years; even then she wouldn't go alone. One of the other witnesses I'm told still to this day begs her family not to go near Lough Fadda. From talking to Ann it sounds as though that despite the shock and bewilderment that accompanied the event they (or at very least she) made the connection that it had to have been one of the strange creatures the old folks spoke of. Most likely they'd at least heard a few stories themselves up to that point. Yet their account was far from standard. Not only were there four of them to testify but the alarming actions of the creature created something of a safety issue. A twentieth century spotlight was now shining down on an ancient mystery. Aside from kindling renewed interest in what was otherwise downplayed folklore, the Fadda account produced a rather unexpected after effect. It would appear Georgina's description was interpreted by members of the Loch Ness Investigation Bureau as a confirmation that Ireland was sporting the very same type of animals as were being reported in Loch Ness. As a result, two LNIB expeditions lead by Captain Lionel Leslie would descend upon the area in an effort to secure a live monster. These two visits would subsequently document a number of otherwise private accounts and thereby created much awareness to the phenomenon as a whole. There apparently was an earlier sighting of some sort by two men in a boat during the 1940s. Details surrounding this one are presently lacking. Legends told of menacing water monsters with voracious appetites, eager to prey upon animals and men alike. While modern sightings may to some degree confirm the existence of large freshwater creatures, their malevolent reputations has yet to be validated. Nevertheless, there are a few unsettling examples where a peiste's peculiar antics were perceived less-than-friendly. The Lough Fadda creature actually swam towards a party of anglers and then upon nearing them displays a wide opened mouth. Another instance of this weird and considerably alarming behavior was observed by Stephen Coyne in 1968. Around seven in the evening on February 22, 1968, farmer and marble quarry worker Stephen Coyne set off to gather dry peat near Lough Nahooin with his eldest and the family dog. As he approached the peat bed Stephen spotted a black object amongst a patch of reeds within the lake. Assuming it was the dog he whistled for it but the dog appeared running along the shore. While in route it noticed the figure in the water and began barking. The previously inanimate object then began coming to life, seemingly aroused from the barking. Stephen could see it was some sort of large animal. In his youth he'd shot seals and otters on several occasions but could clearly see the figure belonged to neither of them. It had a black head rounded "like a kettle" and fused upon a neck an estimated nine inches to a foot in diameter. The skin was black, hairless and slick-looking very much in the same fashion as an eel's. The creature began swimming around the small lough until apparently becoming annoyed at the dog's continual barking. With an open mouth it began homing in on the canine's position. However when Stephen arrived at his dog's side for support it retreated and resumed its aimless swim around the lough. Whenever it would duck its head underwater two humps would come into view. A flat tail was also seen on occasion and in one instance even was extended up towards the head. Stephen sent his son home to fetch a camera. The camera lacked film but when the boy returned he was joined by his mother and additional siblings making a total of seven at the scene. Mrs. Coyne proved to be the bravest of the bunch and drew closest to shore. Perhaps because of her vantage point she would later note what appeared to be horns emitting from the animal's head, a feature unnoticed by Stephen or the children. Stephen thought the closest distance they had between the animal was nine yards whereas Mrs. Coyne felt it was more like five yards. The busy peiste kept up its patrolling back and forth across the lake for the better part of an hour until finally the Coynes felt they'd seen enough and returned home. 1968 wasn't the only time Stephen Coyne had seen a peiste. During a conversation with Holiday he explained that some 20 years prior he and his brother had seen one in the same lake. At first they thought it was a heifer that had fallen in the lough until it began rolling over revealing a white underbelly. Coyne commented to Holiday that the animal looked as wide as the investigator's car. 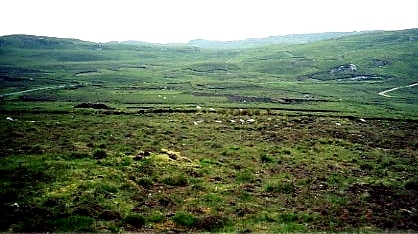 During the Loch Ness Investigation Bureau's second attempt in Connemara expedition member Lionel Leslie came upon a local shepherd who only a month prior had seen the Nahioon peiste on land. In an interview with Holiday, Thomas Connelly explained how on the eighth of September around five o'clock in the evening he had noticed a strange animal lingering on the shore of Lough Nahooin. The creature was rolling or crawling towards the water when Thomas first spotted it only about 15 feet from the lake's edge. It was "bigger than a mare's foal" and very long with a width estimated at 2-2 1/2 feet. The propulsion isn't very well specified. On one hand he's saying it was 'standing up' on top of four stumpy feet yet describes it as "slipped like you slide a log" or "rolled." The head wasn't well noticed due to the distance and the movements of the animal. The skin was commented on as being "very black". Once it entered the water it created spray on both sides and remained a few seconds before sinking. In all his years farming sheep in the area this was the first time he'd seen such a thing. If otters and natural optical illusions can be mistaken for a mysterious creature then the opposite would be just as true. Such was the case with Tom Connelly one April day in 1961 while looking at onto Lough Derrylea from his home. Connelly had became curious with the unusual stationary behavior of what he had assumed were otters. Tom's curiosity sent him down to the lake to inspect. When he came within forty yards he could see that the "otters" were in fact three segments of a single animal. It was an estimated twelve to fourteen feet in length. Connelly could only see the top part of the head which was rounded and "sloped". An eel-shaped tail could also been seen. The skin was cited as "velvetty" (dark) and it was noted that the sun shined on it, most likely implying that it was shiny. The animal would repeatedly submerge and then after about a minute arise in three segments: head, body and tail. Connelly described its motions as "wiggling". For a half an hour this strange submerging and surfacing cycle continued. Anxious to get a better look without having to get too close, Connelly ran to his neighbors to obtain field glasses but they weren't home. When he returned the creature was still occupied with its routine. Tom Connelly recalled his parents would always warn him and his siblings to avoid going near that lake in particular. He remembered hearing folks talk about such creatures calling them an assortment of different names, "Horse-Eel" being one of them. The old people, he said, often claimed that the creatures would travel overland from lake to lake. Connelly mentioned to Holiday how his parents used to talk about the time a horse-eel become entrapped and eventually died in a nearby culvert. One can only guess how many thousands of years these animals have carried about their migrations from salt to freshwater, weaving from lake to lake and then for some equally mysterious reason, returning to the sea. But these unique members of Ireland's fauna are no more immune to man's encroachment upon nature than any other life form. Thus fate fell with an artificial hand upon at least two specimens during a drought in the late 1800s. One peiste narrowly escaped whereas the other, for all we know, might still be resting underneath a grave of muck. Patrick Connelly was a carpenter and blacksmith from Cashel. While working in Ballynahinch Castle near Clifden sometime during the 1880s he was assigned with a most unique task. He was construct a large barbed spear, perhaps with exception to the size, not unlike those routinely used for fishing. Yet the purpose of this weapon was anything but ordinary. Outside the castle a thirty foot eel "thick as a horse" had become lodged underneath a bridge. There had been a drought which undoubtedly hindered the usual flow of water the animals relied upon to travel from lake to lake. The plan for dispersing this hideous obstruction entailed typing a rope around a tree while one end was attached to the spear. Surely such a rare trophy was bound to find its skull mounted above the castles fireplace. While the helpless beast was awaiting its dismal execution, a heavenly pardon arrived. On the second night a flood arrived pushing the fortunate peiste through. Lucky wasn't not in store for a horse-eel that became lodged inside a culvert connecting Lough Derrylea and Lough Crolan. 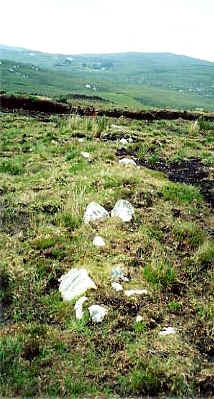 Tradition places the event as occurring roughly around the same time as the Ballynahinch beast therefore possibly making it another immobilized victim to the drought. The animal was described simply as an oversized eel trapped in a gully with a diameter of 18 inches. Almost like a twisted variation of the children's story 'Winnie-the-Pooh', the beast remained wedged in the artificial tunnel. It's grotesque appearance was enough to keep the locals from interfering until it eventually 'melted away.' The remains were said to have been left inside but another tradition claims the culvert was damaged from the animal's struggling and later needed repair. A possibility exists that some of the remains may still found deep within the sediment on both ends of the culvert. Paul Keogh deserves credit for obtaining this one. While working the counter of the Clifden Library Paul struck up a light conversation with a man from Carna. In the course of their discussion Paul happened to ask if the man had ever heard of people seeing unusual water creatures down in his area. The man was at first surprised by unexpected inquiry but divulged a previous experience he'd had sometime in the 1970s. Paul took notes on his story. Presently neither Gary nor I have had an opportunity to meet with this individual so all we have at the moment are the details Paul jotted down. 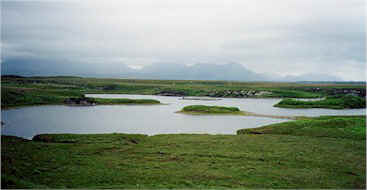 Lough Pybeln is located near Carna and Kilkerrin, between two mountains. The event took place in the summer sometime in the 1970s. The man explained to Paul that he'd been cutting turf with his father and cousin near the lake around 8pm when they noticed a large 40 foot object out in the lake. It resembled the bottom of a pucan (type of boat) "turned upside down, just about to submerge". There's one factor from this sighting that stands out in particular: they saw "slime" from the mountain down to the lake. How far did it run? Did they feel it? How wide was it? Did it have an odor? Did it make any pattern? Hopefully Gary can offer these questions when he visits Connemara this spring (2003).